THE BRIGHT LIGHT SOCIAL HOUR performs the song “LIE TO ME” for BalconyTV. 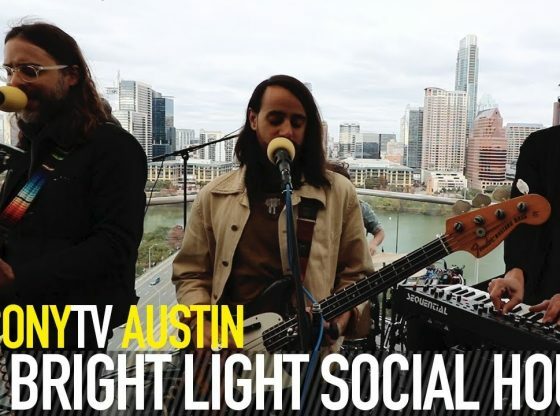 The Bright Light Social Hour first came together in 2004 when founding members Jack O’Brien (keyboards and vocals) and Curtis Roush (guitar) were students at Southwestern University in Georgetown, Texas, less than an hour’s drive from Austin, the state’s busiest city for music. Initially part of a college art-rock cooperative, O’Brien and Roush teamed up with drummer Thomas Choate and bassist Ryan O’Donoghue and began playing shows with local punk and alternative bands. By 2006, Choate’s studies took him away from Texas, and Joseph Mirasole, who had learned his percussion skills playing with a drum corps, joined the group. In 2007, the Bright Light Social Hour recorded their first EP, Touches, and following the departure of Ryan O’Donoghue, O’Brien moved from keys to bass. The band recruited a new keyboard player, A.J. Vincent, and issued a second EP, Love Like Montopolis, in 2008. As the Bright Light Social Hour’s sound became more eclectic and ambitious, they began blocking out plans to cut an album, and their self-titled full-length debut, issued by Maple Music Recordings in 2010, became a sensation in their new hometown of Austin, where it earned them six trophies at the 2011 SXSW Austin Music Awards, including Album of the Year, Song of the Year (for “Detroit”), and Band of the Year. Having made a big splash at home, the group sought out new worlds to conquer by hitting the road, playing hundreds of shows over the next several years, including appearances at Lollapalooza and the Austin City Limits Music Festival. Top 5000 Songs. on radiovibrations.com "Play the best song in the world or I'll eat your souls" (the shiny daemon in the Tenacios D masterpiece 'Tribute') Could I suggest 5000?